For the short week of November 24-26, we are focusing on gratitude. The Thanksgiving holiday is always a wonderful reminder that despite the many obstacles we face, we can always find something to be grateful for. We hope you will take a moment to reflect on the many joys and gifts that our profession brings, and then we hope you will capture and share photos that tell that part of your #EVSCstory with us. This photo was shot with a mobile phone in Mrs. Wilhelmus’ classroom at North High School and features some of her AP Language students. The photo was edited in iPhoto and Fotor, a great web app for photo editing. You can share via Instagram- Simply post your Instagram photos using the hashtag #EVSCstory. Feel free to add other hashtags as well to indicate the theme (e.g. 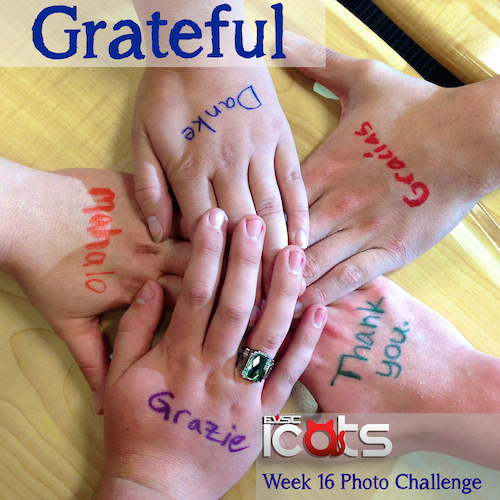 #Grateful), or add more information to the caption to help tell the story. We are grateful to everyone who has been helping to tell the #EVSCstory! To date we have collected more than 600 fantastic photos, and we can’t wait to add this week’s batch to the mix! We would love to have your help in growing this project. Please consider sharing the project with your colleagues, and keep the photos coming! We also want to wish you a restful and joyful holiday weekend! Next articleDay 24 #30DC14: Need A Brain Break? ICATS Weekly Photo Challenge- Week 17- What Are You Reading?